It is a shame that Washington politics have descended into a blame game about who is responsible for the sequester. Or maybe that’s the whole point. It seems to me that blame has been elevated to high art by some out national leaders. So let’s be absolutely clear: The angry accusations that Republicans are at fault for letting sequestration happen are misleading on three levels. 1. Is sequestration a big deal economically? That is an open question – insert chapter and verse about the failure of Keynesian stimulus, notably the 1946 doomsday scenario that never occurred when defense spigots were turned off – but also moot. 2. The Senate has been sitting on its hands for pretty much the entire Obama administration. How many YEARS have elapsed since it passed a budget? The notion that sequestration is central to this long drama is the hobgoblin of short attention spans. Sequestration is the latest paragraph in a long book, thematically consistent with but largely irrelevant to the plot. 3. What we are witnessing is not an economic crisis but something simpler. Political dysfunction. It’s not that Washington is broken, per se. The city is operating exactly as (re)designed, like an airplane without wings. So who designed our politics this way? That’s the mystery. House Speaker John Boehner used some choice words to pressure Senate Democrats to avert the looming sequester — $85 billion of arbitrary across-the-board cuts — insisting that “the House has done its job” and the burden to offer an alternative before the cuts strike Friday is on the president’s party. House Republicans voted twice during the 112th Congress to narrowly pass legislation to offset sequestration with alternative savings, but those measures languished in the Senate and expired with the end of the session. I’m heading off to the Air Force Academy to speak to cadets and faculty, thanks to the Economics Department. After that, I will be participating in the Fordham debate sponsored by the University of Utah Law School (which is free and open to the public). It will be a nice homecoming in C Springs, but there is even more of a homecoming at UU where we journeyed for debate tourneys once a semester back in the day. Taking the laptop … not the skiis, alas. 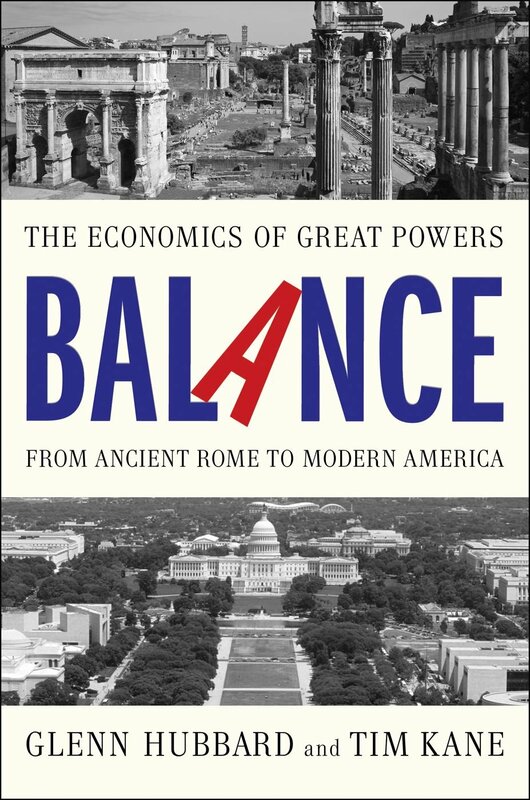 Here’s the cover image for BALANCE, which has a final, final, seriously final publication date of June 11, 2013. This whole book is just about the coolest topic to work on that I can imagine. Even so, it’s work. But selecting a cover design is like icing on the cake: pure fun. Glenn and I were very involved in the concept and image selection, and I honestly love the final product. Our editor (Ben) managed the whole thing smoothly and was great at soliciting our thoughts and feedback. The design team came up with the idea of the tilted “A” in Balance, which I think is awesome. We were hoping for an iconic image (and thought a lot about drawing up something original like Paul Kennedy did with his hardcover). The titled A seems to fit that iconic purpose here, which the designers bracketed with the two images. However, early drafts of the images had options with lots of classical paintings, and did not have the Roman forum as an option. We suggested that to go along with the DC Mall image. The design team really nailed it by finding these two photographs which mirror one another. I also think the grayscale treatment is perfect. If you look closely, you can even see people on both landscape, the Forum and the Mall. What do you think? Well, if you LIKE it, tell us what you think! We’ve crossed the Rubicon now, so hopefully it’s a success. We’re in the thick of copy edits for BALANCE with the team at Simon and Schuster. It is fun, but intense. Glenn crushed it last Sunday — did the whole book manuscript in about six hours. The man is fast, and makes me feel like Fred Flintstone trying to yabba-dabba-do my stone age car uphill…. One of the more frustrating issues to deconflict is the table/figure dealing with federal expenditure projections. In particular, why is there disagreement between CBO and OMB numbers, particularly on current and past Medicare outlays? This is bizarre, and arcane as well. Actually the latter probably explains why federal officials feel they can get away with monkeying around with the numbers to obscure real costs. “Who’s gonna call us on it? It’s boring!” Well, kudos to J.D. Foster at the Heritage Foundation who explains how the OMB is misleading. In the OMB figures, offsetting receipts such as Medicare premium income are subtracted from total Medicare outlays. This means the figure in the budget is not total Medicare spending as might be presumed from and as is suggested by the headings in the various tables. Rather, the budget presents a measure of the net spending on Medicare that must be financed through other means besides premiums, such as payroll tax receipts and transfers from the General Fund. This is a valid and useful concept, but not the most important, nor the one expected by the reader or suggested by the headings.